One of our goals here at KJC is to provide a diverse, multi-cultural approach to education. We continuously host international artists, such as Ray Heberer. Ray, a brass instrumental expert, joined us from Taiwan for a short period of time. We are also grateful that some of these outstanding international musicians choose to stay here longer so they can share ideas with KJC and enrich the local music scene. 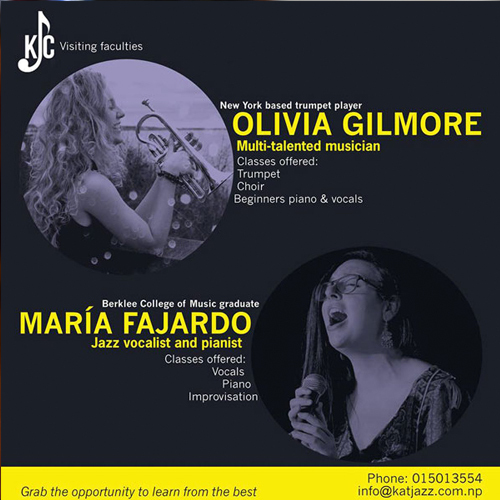 One of them is María Fajardo from Spain, who has recently graduated at the internationally acclaimed Berklee College of Music in Boston, USA. She is a jazz singer who has developed her jazz language from professors like Mili Bermejo, Alison Wedding, Ed Tomassi, Peter Eldridge and Kris Adams among others. Our second visiting faculty is Olivia Snow Gilmore, a trumpet player coming from New York. She comes from classical roots and also has a background in singing jazz. An amazing teacher for all levels and especially for beginners in trumpet and piano, she will also be teaching our choir! Her classes begin this February. Grab the opportunity to learn from them and contact us for inquiries.